Trailheads: What Does the Whistle Pig Say? What Does the Whistle Pig Say? I don't know why I always fall for the hype of Groundhog Day (the annual vigil for the end of winter, not the movie, which I liked). Punxsutawney Phil, Octorara Orphie, and others whose names escape me at the moment. No matter what they see tomorrow (Feb. 2) there will be at least six more weeks of winter. It's Pennsylvania after all. Anyway, winter activities will get us through; the ongoing programs and events in the coming week are listed below. The usual winter caveats apply here: some sites are on reduced hours this time of year, and weather may interfere with operating schedules and special events, so please check ahead if you're not sure. The complete (as far as I know it) February program page is available if you want to plan ahead. UPDATE on the whistle pigs, 2/4/19: so Phil did not see his shadow, which means an early spring (video courtesy of VisitPA). But Octoraro Orphie and Mount Joy Minnie, in Lancaster County, saw their shadows, which means 6 more weeks of winter. My comment above stands. 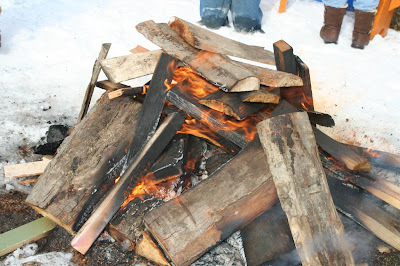 Check out the Cabin Fever Party at Historic Pithole on Feb. 2! Thursdays through March 28: Winter History Class—learn about the history of the community at Ephrata and the world that surrounded it (more info on Facebook page). Speakers include site staff as well as outside scholars (list of session topics and speakers). Sessions are held from 9 am to noon each Thursday through March 28, and there is a field trip (extra charge) on April 4. Cost for the entire class is $55, $45 for members; you can attend individual classes for $10 each. Call the site at 717/733-6600 for more information or to register. Feb. 2: Museum reopens—Fort Pitt Museum is back to regular hours, after being closed for exhibit upgrades and maintenance. Ongoing: Winter Learning for Adults—winter weekends mean learning opportunities, including craft and trade classes, lectures, and classes offered by the Heirloom Seed Project. Schedules and costs vary. The full list of classes through April is on the website, along with a registration form. Feb. 1: Storytime—this month's book is The Most Magnificent Thing by Ashley Spires. Participants will use their imaginations to create their own "magnificent thing." Geared for ages 3-5 with accompanying adult. Included in regular admission. 10-11 am.